Savvy real estate investors know that 1031 exchanges are commonly used to defer paying capital gains tax and/or completely eliminate them through estate planning. This maneuver helps investors stay more liquid and redeploy capital gains to grow their portfolios at a faster clip than would otherwise be possible. But if the IRS 1031 tax-deferred exchange rules aren’t followed to the letter, real estate investors will be liable for capital gains taxes. Consider a tale of two investors, one who used a 1031 exchange to reinvest profits as a 20% down payment for the next property, and another who used capital gains to do the same thing. We are using round numbers, excluding a lot of variables, and assuming 20% total appreciation over each 5-year hold period for simplicity. The first purchase below was made with 20% down, which is then reinvested into the second property, and so on. This table also doesn’t account for current cash flow generated during each hold period, which would presumably be higher when using 1031 exchanges to increase purchasing power for each reinvestment. 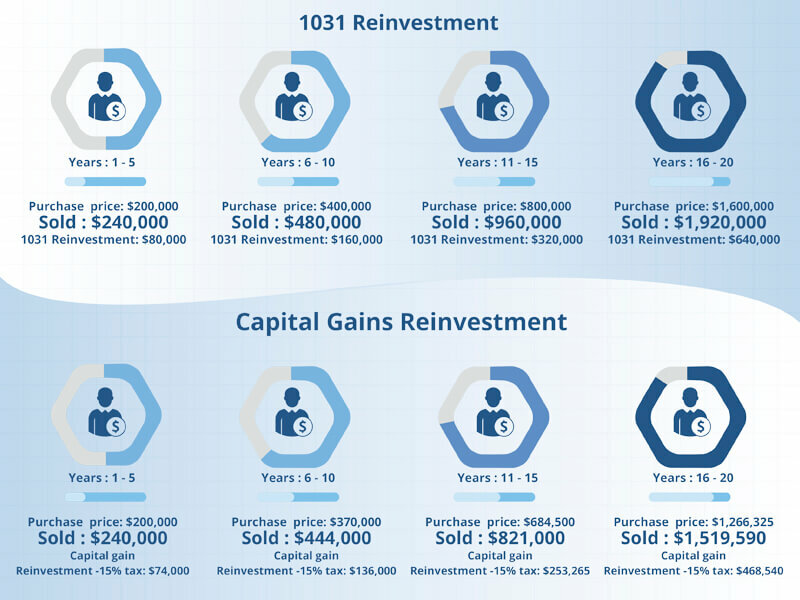 After 20 years, the expected portfolio value of $1,920,000 when pursuing a 1031 exchange strategy compares favorably with a projected value of only $1,519,590 when paying capital gains taxes along the way. What a difference! It’s no wonder savvy real estate investors are tapping into this strategy more and more. Here’s advice on what you can—and can’t do—with 1031 exchanges. Delayed exchange with one property being sold—or relinquished—and a replacement property (or properties) purchased during the allowed window of time. Delayed/simultaneous exchange with the replacement property purchased at the same time the current property is sold. Delayed reverse exchange with the replacement property purchased before the current property is relinquished. Delayed build-to-suit exchange with the current property replaced with a new property built-to-suit the need of the investor. Delayed/simultaneous build-to-suit exchange with the built-to-suit property purchased before the current property is sold. 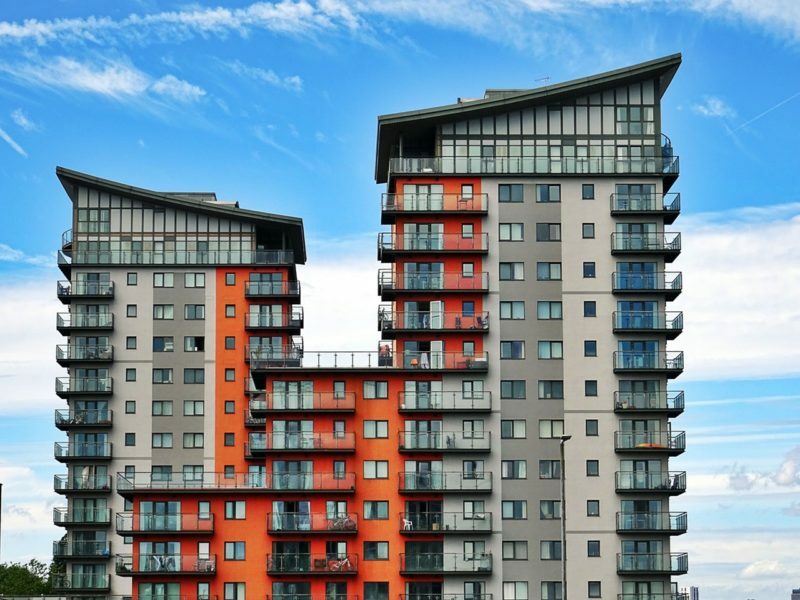 It’s important to note that investors cannot receive proceeds from the sale of a property while a replacement property is being identified and purchased. Instead, funds are held in escrow by a 1031 exchange intermediary—sometimes referred to as an accomodator—until the replacement property is purchased. The intermediary cannot be someone who has acted as the exchangor’s agent, such as your employee, lawyer, accountant, banker, broker, or real estate agent. It is best practice however to ask one of these people, often your broker or escrow officer, for a reference for a qualified intermediary for your 1031. 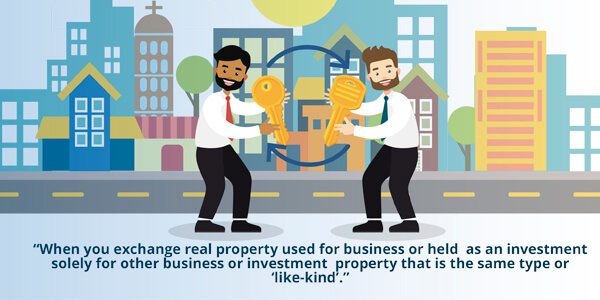 Real estate investors making like-kind exchanges generally aren’t required to recognize a gain or loss under the Internal Revenue Code, unless they receive other not like-kind property or money, or if the property was held mainly for sale and not for business use. According to the Internal Revenue Service, property is like-kind if it’s the same nature or character as the one being replaced, even if the quality is different. The IRS considers real estate property to be like-kind regardless of how the real estate is improved. 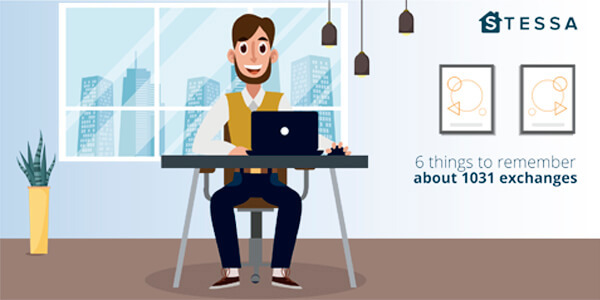 For example, real estate investors can exchange a small apartment building for a larger apartment project, for an office building, or for vacant land. The Tax Cuts and Jobs Act of 2017 eliminated personal and intangible property from being included in tax-deferred exchanges. That includes items such as machinery, equipment, artwork, collectibles, patents and intellectual property. However, the Act created an Opportunity Zones incentive to encourage long-term and tax-deferred investments in urban and rural areas with low-incomes. Opportunity zones are in all 50 states, and U.S. Territories such as Puerto Rico and the Virgin Islands. Real estate investors need to plan ahead when doing a 1031 exchange. That’s because the IRS only allows 45 days to identify a replacement property for the one that was sold. 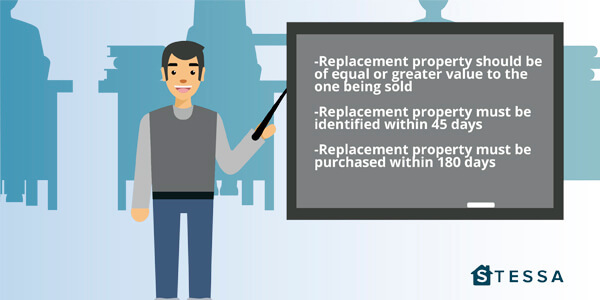 But in order to get the best price on a replacement property experienced real estate investors don’t wait until their property has been sold before they start looking for a replacement. Imagine calling a real estate broker who has a property listed for sale and telling them there are only two days left to identify a replacement property. The odds of getting a good price on the property are slim to none. The purchase and closing of the replacement property must occur no later than 180 days from the time the current property was sold. Remember that 180 days is not the same thing as 6 months. The IRS counts each individual day, including weekends and holidays (even federal holidays), to determine the 180-day time frame. Real estate with an existing mortgage can also be used for a 1031 exchange. The amount of the mortgage on the replacement property must be the same or greater than the mortgage on the property being sold. If it’s less, the difference in value is treated as boot and it’s taxable. In this example let’s pretend that the real estate investor is tired of owning real estate, has no heirs, and chooses not to pursue a 1031 exchange. When the building is sold the capital gains tax due would be: $2,000,000 sales price minus $1,000,000 cost basis = $1,000,000 profit x 20% capital gains rate = $200,000 + potentially another 3.8% net investment tax on high earners + any additional state capital gains taxes depending on where the property is located. In California, the state capital gains tax liability can be as high as an additional 13.3%, or another $133,000! First: Sell the current multifamily building and send the $1M proceeds out of escrow directly to a 1031 exchange facilitator. Next: Within 45 days from the closing of the sold building identify one or more replacement properties whose total value is at least $2 million – in this case we’ve found a multifamily building for sale for $2 million, a retail shopping center for $1.5 million, and an apartment building for $2.5 million. 1031 exchanges defer—or put off to the future—the payment of accumulated capital gains tax. But what happens when the real estate investor passes away? When real estate is passed on to an heir, the property is revalued—or stepped up to—its fair market value and any deferred capital gains taxes are eliminated. Which only goes to show that the saying, ‘Nothing is sure except death and taxes’ is only partly true! 1031 exchanges are like having an interest-free loan from the IRS. Instead of paying tax on capital gains, real estate investors can put that extra money to work immediately and enjoy higher current rental income while growing their portfolio faster than would otherwise be possible.